The Environmental Impact Assessment (EIA) Report (Register No. : AEIAR-185/2014) prepared for the “Expansion of Hong Kong International Airport into a Three-Runway System” (the project) has been approved by the Director of Environmental Protection, and an Environmental Permit (Permit No. : EP-489/2014) has been issued for the project under the Environmental Impact Assessment Ordinance. Pursuant to Condition 2.1 of the Environmental Permit (EP), the Airport Authority Hong Kong (AAHK) is required to formulate and deposit a detailed Complaint Management Plan (CMP) which include a dedicated complaint hotline and an email channel for timely response to complaints; and AAHK shall set up Community and Professional Liaison Groups to facilitate communications, enquiries and complaints handling on all environmental issues related to the project, in order to enhance transparency and communication with the public. The requirement related to complaints handling involves providing the means to ensure timely investigation and response to environmental complaints. The first submission of the CMP, in compliance with Condition 2.1 of the EP, was made to the Environmental Protection Department (EPD) on 18 September 2015, then publicised on the project’s dedicated website in November 2015. This latest submission presents an updated mailing address for receiving written comments, enquiries and suggestions. Mott MacDonald Hong Kong Limited (MMHK) was appointed by AAHK to provide environmental consultancy services which include the establishment of a CMP detailing the process and actions to be taken in the event of environmental complaints associated with the project. ● Any other modifications, reconfiguration, and/or improvement of the existing facilities on the existing Airport island as a result of the third runway. This CMP sets out the complaint management process for the project. The key parties involved in the CMP and their overall roles and responsibilities are presented in Table 1.1. The AAHK, as the project proponent, bears the overall responsibility for the project, and has to assure that the CMP is issued and followed by all the relevant parties of the project. The ET is responsible for setting up and managing the dedicated complaint hotline and email channel. The ET is also responsible for managing the complaints process, carrying out complaint investigation and recording the findings as part of the EM&A process. The IEC is responsible for auditing the complaints handling, investigation and reporting process by the ET and the effectiveness of mitigation measures implemented by the Contractor. The Contractors have the primary responsibility for implementing the required mitigation measures and ensuring their works comply with all environmental legislation and the EP requirements as well as any additional conditions specified in their works contracts. The Contractors are responsible for providing all necessary input / information to the ET as part of the complaint investigation process. The Contractors are also required to implement all mitigation measures, corrective actions or any additional measures required to address environmental complaints. 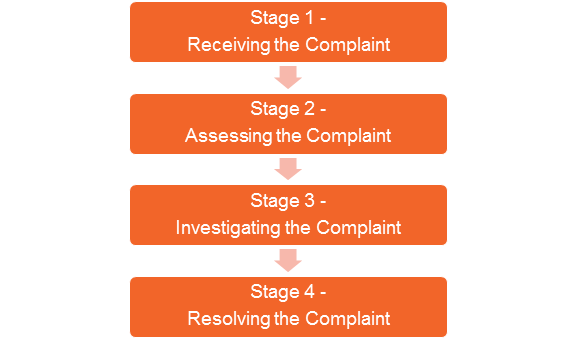 As part of the EM&A requirements of the project, the overall environmental complaint handling process is shown in Figure 2.1. Details of each of the stages in the handling process are described in the following sections. 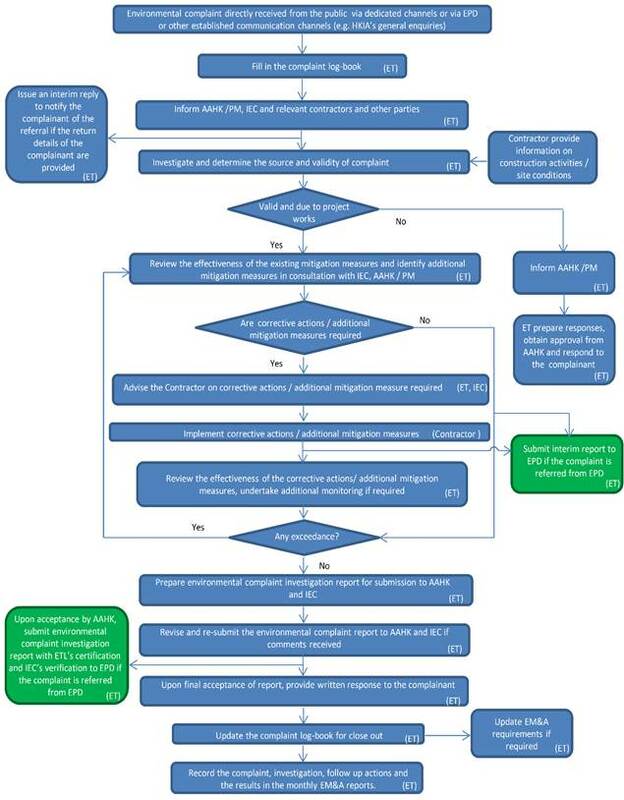 A detailed environmental complaint handling flow chart is shown in Appendix A. The public can raise environmental complaints that are related to the project via telephone. The ET established a dedicated complaint hotline for receiving any public comments. The dedicated hotline number is provided below. This dedicated complaint hotline is also publicised on the dedicated project website. The dedicated complaint hotline is managed by the ET. All calls will be received and recorded by the ET during operation hours. The operation hours of the hotline are from 08:30 to 17:30, Monday to Friday except public holiday during the construction period of the Three-Runway System. Any missed calls (such as when the line is busy or when the call is received outside the operating hours) will be directed to a voicemail system where callers can leave their contact details for the ET to return calls. 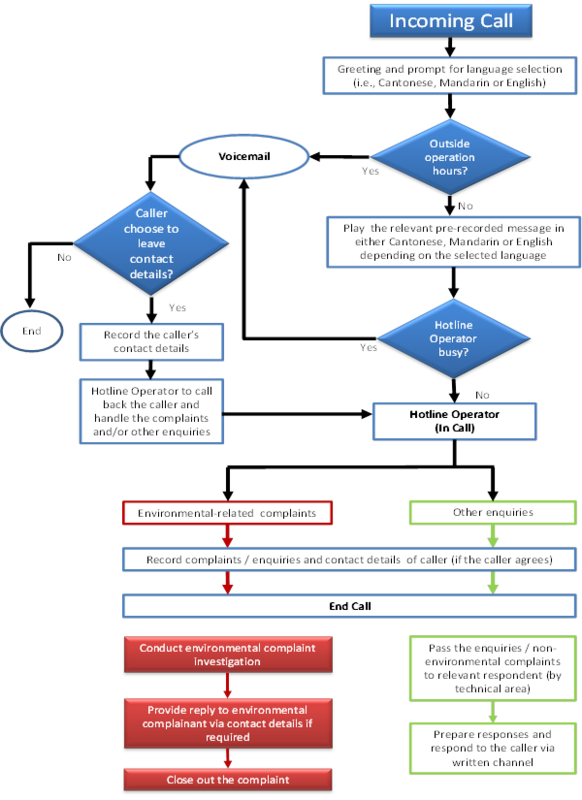 The operation flow chart for the dedicated hotline is shown in Appendix B. The ET had set up a dedicated email channel, managed by the ET, for receiving written environmental comments raised by the public. The dedicated email address is provided below. Details of the dedicated email address, mailing address and fax number for written comments, enquiries and suggestions are also publicised on the dedicated project website. Members of the public may choose to submit complaints on the project to EPD via EPD’s general environmental complaint channel. All complaints referred to AAHK from EPD will be recorded by the ET and a reply will be issued to EPD to confirm receipt of the complaint. Environmental complaints may also be received from other communication channels such as via the Community Liaison Group (CLG) and Professional Liaison Group (PLG), or referred from other sources such as the Hong Kong International Airport general enquiries / customer services desk. All written complaints received from such other channels will be passed directly to the ET. For any questions or comments received from CLG / PLG members during CLG / PLG meetings, these will be responded directly in the meetings or in subsequent CLG / PLG meetings. For any other non-written complaints, the complainant will be referred to the dedicated complaint hotline and / or email channel for registering their complaint. ● Details of the responses and actions required / taken. Once a complaint is received, it must be logged, defined and categorised as soon as possible, before referring to the appropriate party. Table 4.1 lists the relevant parties for referring complaints and other enquiries and suggestions to. Where a return postal address, fax number and / or email address of the complainant is provided, the ET shall issue an interim reply within 3 working days to acknowledge receipt and notify the complainant of the referral of their complaint to other relevant parties where appropriate. As illustrated in Figure 5.1, the starting point for complaint investigation is to collect all relevant information. Based on the details of the complaint received, the ET should collect the required information from the Contractor(s), including details related to the construction activities and site conditions that may have a bearing on the complaint, as well as the mitigation measures currently implemented on site. During the complaint investigation work, the Contractor and AAHK / PM should cooperate with the ET in providing all necessary information and assistance for completion of the investigation. The ET should also review the relevant environmental monitoring data of nearby monitoring stations to ascertain if there are any associated changes or environmental exceedances that may be linked to the complaint. Based on the aforementioned information obtained, the ET shall assess whether the source of the problem is likely to be due to the construction activities of the project, and also ascertain which specific works sites and / or activities are the likely causes. 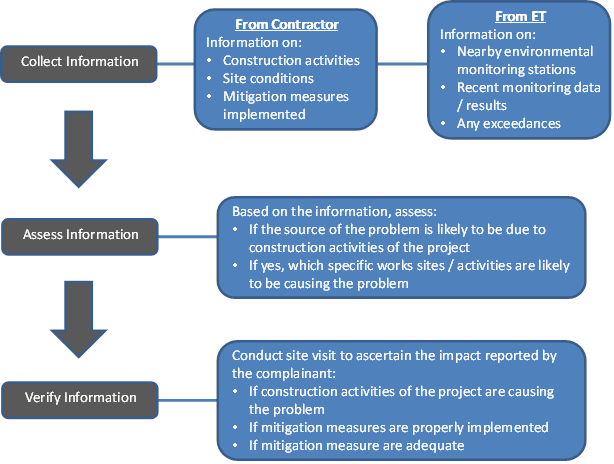 To verify the information obtained and whether the source of the problem is actually due to the construction activities of the project, the ET should conduct site visit with Contractor(s) and actively check for the source of the problem, and whether the relevant mitigation measures have been properly implemented by the Contractor. The ET should also check the effectiveness and adequacy of the existing mitigation measures implemented. If mitigation measures are identified as required during in the investigation by the ET, the Contractor should promptly carry out the mitigation works. AAHK / PM should ensure that the measures have been carried out by the Contractor. For every environmental complaint that is confirmed to be valid and due to the project’s activities, the ET shall compile an environmental complaint investigation report containing all the relevant information and responses from the relevant parties and the follow up actions taken. ● Recommendations to prevent re-occurrence of similar complaint. If the complaint is referred from EPD, an interim report on the status of the complaint investigation and follow up actions shall be submitted to EPD by the ET. The final complaint investigation report shall be certified by the ET and verified by the IEC before submission to EPD by the ET for EPD’s record. Independent audit of the complaint investigation process and the report will be conducted by the IEC. The IEC will also audit and verify the effectiveness of the existing and additional mitigation measures implemented to minimise re-occurrence of similar complaints. Upon final acceptance of the environmental complaint investigation report, the ET shall provide a written response to the complainant (except in cases where the complaint is referred from EPD), and update the record with details of the complaint investigation, follow up actions and other relevant information of the complaint in the complaint log-book. The time that would take to investigate a complaint depends on the circumstances involved and would be different for each individual case, still, the complainant would be contacted within 4 weeks from the receipt of the complaint and be provided with an update of the investigation, and would also be given the investigation results when available. For cases where the complaint is referred from EPD, the ET shall provide the final complaint investigation report (certified by the ET and verified by the IEC) to EPD for their reply to the complainant. The ET shall also summarise the status of complaints received, including investigation findings and follow up actions taken, in the monthly EM&A reports, which are subject to review and verification by the IEC.